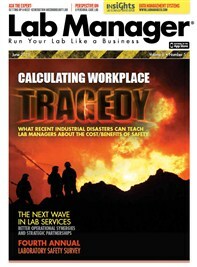 What recent industrial disasters can teach lab managers about the cost/benefits of safety. A predominant perception among too many workplaces is that safety is expensive. That it costs too much to comply with all the personnel training, hazard assessments, workplace surveillance, medical evaluations, record keeping, etc. But have you ever really stopped to consider the full cost of a workplace mishap? Even a “minor” one? What about a serious or catastrophic accident? What would that end up costing? This article takes an in-depth look at the big picture and reveals a disturbing trend. Is there a pattern emerging in American business? The detonation killed at least 15 people, most of them firefighters and other first responders, and injured almost 200 others. West, Texas, has a population of only 2,800 people, so chances are good that if you live there you know someone who was killed or injured. A whole community was devastated in an instant. The Occupational Safety and Health Administration (OSHA) had not inspected the fertilizer plant since 1985. The plant stored more than 270 tons of ammonium nitrate. After the attacks of September 11, 2001, Congress passed legislation that any plant storing more than 400 pounds of ammonium nitrate is supposed to report it to the Department of Homeland Security. The West Chemical and Fertilizer Company did not report the ammonium nitrate even though the plant had more than 1,350 times the reportable quantity on hand. The Environmental Protection Agency (EPA) requires companies that store high-hazard chemicals to prepare an emergency response plan. In 2011 West Chemical and Fertilizer Company filed its emergency response plan with the EPA. The company reported one-tenth of the amount of ammonium nitrate on-site and indicated that the facility did not pose an explosion or fire hazard. Why? Since 1995, when Timothy McVeigh bombed the Federal Building in Oklahoma City using this same chemical, everyone knows how dangerous it is under the wrong circumstances. And West Chemical and Fertilizer Company had more than 135 times the amount McVeigh used. West Chemical and Fertilizer Company was fined by the EPA $2,300 in 2006 and $5,250 in 2011 for failing to have a safety plan for the large, 12,000-gallon pressurized cylinders of anhydrous ammonia onsite. 2 Investigators suspect this dangerous chemical may have played a role in the explosion. How much would it have cost to write a safety plan, prepare a true and complete emergency response plan, and conduct a risk assessment? Would these have prevented the disaster? Maybe, maybe not, but surely they would have helped lessen the severity. What are the costs faced now by West Chemical and Fertilizer Company? West Chemical and Fertilizer Company is just one very recent catastrophic accident among U.S. businesses. Too often we are seeing similar failures or safety-averse decisions in recent times. And the disasters are not only increasing in numbers but becoming more serious. Another example is the 2005 Texas City refinery explosion where 15 workers were killed and 170 injured.3 According to the U.S. Chemical Safety and Hazard Investigation Board, an independent federal agency charged with investigating industrial chemical accidents, a production tower (technically the isomerization tank) became over-pressurized, discharging fuel into the blowdown drum, overwhelming the system, and forcing liquid and vapors up the 120-foot stack. As the petroleum rained to the ground, it was ignited, resulting in an explosion powerful enough to rip the roof off a benzene storage tank three football fields away. Blowdown tanks are a common feature at petroleum refineries, as are stacks used to release gases and vapors. However, safe stack vents include a flare system—a sort of pilot light that burns potentially hazardous vapors as they exhaust out. In 1992 OSHA mandated that the Texas refinery switch to a flare system. Amoco, which merged with BP in 1998, appealed and OSHA withdrew the request. The refinery continued to use stacks without the flare system, which allowed explosive fumes to escape. How much would it have cost to install a flare system in the stack? Would a flare system in place have prevented the explosion? Probably, but even if it didn’t, it would have given plant personnel more time to respond to the situation and control it. What costs has BP incurred as a result of this disaster? And yet another example: In 2008 an explosion at the Imperial Dixie Crystal sugar refinery in Port Wentworth, Georgia, killed 14 workers and injured 42 others. This blast resulted from an over-accumulation of combustible dust, in this case sugar dust, which was most likely ignited by an overheated bearing on a loading conveyor. The explosion originated in the basement of one of three 100-foot-tall storage silos holding refined sugar. Poorly designed dust collection systems, antiquated construction, and inadequate housekeeping practices allowed the dust and spilled sugar from conveyors and handling equipment to build to dangerous levels. Once an ignition source was introduced, the first explosion, or “primary event,” occurred. This set off a powerful cascade of secondary explosions as sugar dust and spilled sugar on equipment, floors, and horizontal surfaces were dislodged, producing an everexpanding cloud of explosive dust. The Chemical Safety and Hazard Investigation Board indicated in its 2009 report that “Imperial’s management as well as the managers at the Port Wentworth refinery did not take effective actions over many years to control dust explosion hazards—even as smaller fires and explosions continued to occur at their plants and other sugar facilities around the country.”4 In fact, the sugar industry was very familiar with the dangers of sugar dust explosions dating as far back as 1925. The Port Wentworth refinery was built in 1916 and much of the equipment and machinery were more than 28 years old. Obviously, the cost to upgrade dust collection equipment and handling/loading machinery and conveyors would have been a major expense for Imperial. But hadn’t the company recovered the initial cost of investment many times over during the previous 28-plus years? Was the decision to put off the needed safety and equipment improvements worth the consequences? Let’s take a quick look at one final example— probably the most expensive of all those given so far. On April 20, 2010, an explosion on the Deepwater Horizon semi-submersible mobile offshore drilling unit killed 11 workers and injured 16 more. The subsequent fire caused the $500 billion MODU, or drilling rig, to sink, resulting in a massive offshore oil spill. When the drilling platform sank, the deep water well casing broke off near the sea floor and gushed for 87 days before a temporary cement cap could be installed to plug the flow. It is considered the largest marine oil spill in the world and was the largest environmental disaster in U.S. history. The explosion and fire that sank the Deepwater Horizon drilling rig were basically the result of a blowout—which is “the uncontrolled release of crude oil and/or natural gas from an oil well or gas well after pressure control systems have failed.”5 Most likely, a huge bubble of methane gas escaped the wellhead and blowout preventer and expanded rapidly as it shot up the well casing. Upon reaching the top of the casing, it engulfed the platform and exploded as the large diesel generators provided the ignition source. The subsequent fire could not be extinguished and the Deepwater Horizon MODU sank on April 22. In May 2011 BP estimated that the total costs from the spill, property loss, environmental cleanup, and subsequent lawsuits would top $41 billion. What would it have cost to install shutoff valves and gas detection systems in the generator rooms? Granted, the extreme disasters mentioned above do not represent the average research or production laboratory. But the point we are trying to make is that more and more large U.S. businesses seem to be deciding that safety and regulatory compliance are too costly. And that it is better business to run the risk of fines or accidents than to spend money on proper safety controls, safety equipment, and risk assessments. Will small businesses and other sectors follow the big boys’ lead? We want to ask the decision makers: Is the devastation of local communities and economies worth the price of operating safely? Are the costs of the medical and life insurance claims, property damage, loss of product, loss of production, workers’ compensation claims, regulatory fines and penalties, and years of lawsuits less than the cost of running a safe facility or business? There are many similar failings identified in the follow-up investigations of these catastrophic industrial accidents. In-house as well as independent units, such as the Chemical Safety and Hazard Investigation Board, usually find numerous technical and organizational problems. Organizational flaws include corporate cost cutting, failure to invest in plant infrastructure, and lack of corporate oversight and major accident prevention programs, among others. Too often the focus is on occupational safety while process safety is overlooked. Inadequate training of personnel and a lack of competent supervision combined with poor communication and perhaps the use of outdated or ineffective work procedures are a recipe for disaster. Technical failings are facility and task specific but would include insufficient design of safety systems; lack of preventive maintenance, especially on safety-critical systems; nonexistent or inoperative alarms; and the continued use of outdated technology when replacement with available, safer equipment is feasible. How do you calculate the true, full cost of a workplace tragedy? Is the company bottom line our raison d’être? What should be our holy grail? Do we ignore and avoid safety no matter the ultimate costs or consequences?